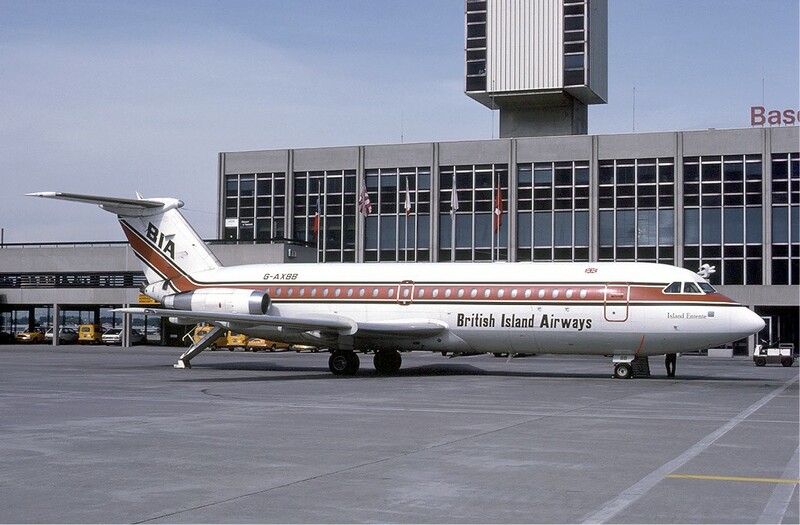 The British Aircraft Corporation One-Eleven, also known as the BAC 1-11, the BAC-111 or the BAC-1-11, was a British short-range jet airliner of the 1960s and 1970s. Conceived by Hunting Aircraft, it was developed and produced by the British Aircraft Corporation when Hunting merged into BAC along with other British aircraft makers in 1960. The One-Eleven was designed to replace the Vickers Viscount. It was the second short-haul jet airliner to enter service, the first being the French Sud Aviation Caravelle. Due to its later service entry, the One-Eleven took advantage of more efficient engines and airline experience of jets. This made it popular, with over half of the sales at its launch being in the largest and most lucrative market, the United States. The One-Eleven was one of the most successful British airliner designs, and served until its widespread retirement in the 1990s due to noise restrictions. In 1956, both Vickers and Hunting started design studies on jet replacements for the Viscount. Vickers offered a 140-seat development of its VC10 project: the VC11. Hunting offered the all-new 100-seat Hunting 107. In 1960 Hunting, under British government pressure, merged with Vickers-Armstrongs, Bristol, and English Electric to form BAC. In 1961, BAC decided to continue work on the Hunting 107 as a private venture. It redesignated it One-Eleven (the first BAC project and the eleventh Vickers civil aircraft). Because of the short delay over the merger, the One-Eleven was able to use the new Rolls-Royce Spey turbofan, greatly improving its fuel economy. BAC was concerned the aircraft was too large to fit the Viscount role in the original Hunting configuration and reduced its capacity to 80 seats. This version became the One-Eleven 200, the original design having retroactively become the 100. In May 1963, BAC announced the One-Eleven 300 and 400. The new versions used the Mk. 511 version of the Spey with increased power, allowing more fuel upload and hence longer range. There were a number of other changes, with the main visual difference being in the nosewheel doors. The difference between the 300 and 400 lay in their equipment and avionics, with the 400 intended for sales in the USA and thus equipped with US instruments. American Airlines ordered 15 aircraft on 17 July 1963, bringing the order total to 60, plus options for many more. American Airlines eventually bought a total of 30 of the 400-series, making that airline the largest ever customer of One-Elevens. This was assumed to be enough for BAC to break even on the project. In retrospect, however, many have doubted whether BAC and its successors made money on the One-Eleven. The prototype (G-ASHG) rolled out of the Hurn assembly hall on 28 July 1963, its first flight following soon on 20 August. This was almost a year ahead of the competing US airliner, the Douglas DC-9. This lead was commercially most important, since — as shown by the Bonanza case — US authorities could refuse to approve sales of foreign aircraft to domestic airlines where an American alternative existed. The One-Eleven prototype, flown by test pilot Mike Lithgow, crashed with the loss of all on board on 22 October during stall testing. The investigation led to the discovery of what became known as deep stall or superstall, a phenomenon caused by reduced airflow to the tailplane caused by the combined blanking effects of the wing and the aft-mounted engine nacelles at high angles of attack, which prevents recovery of normal (nose-down) flight. To obviate this, BAC designed and added devices known as stick shakers and stick pushers to the One-Eleven's control system. It also redesigned the wing's leading edge to smooth airflow into the engines and over the tailplane. Despite the crash, testing continued and customer confidence remained high. American Airlines and Braniff took up their optional orders and placed further ones in February 1964. Further orders came from Mohawk, Philippine Airlines and Helmut Horten who ordered the first Executive modification of the aircraft. By the end of 1964, 13 aircraft had rolled off the production line. The One-Eleven was certified and the first handover, of G-ASJI to BUA, was on 22 January 1965. After several weeks of route-proving flights, the first revenue service flew on 9 April from Gatwick to Genoa. Braniff took delivery of their first aircraft on 11 March, while Mohawk received their first on 15 May. Deliveries continued, and by the end of 1965 airlines had received 34 aircraft. Demand continued to be buoyant, with a second production line set up at Weybridge. In 1967 a larger 119-seat version was introduced as the One-Eleven 500 (also known as Super One-Eleven). This 'stretched' version was delayed for at least a year while its launch customer BEA assessed its requirements. This gave competing US aircraft (the DC-9 and Boeing 737) the chance to make up for the One-Eleven's early penetration of their domestic market. The British aircraft's initial one-year advantage now turned into a one-year delay and the 500 failed to sell in the USA. Compared with earlier versions, the One-Eleven 500 was longer by 8ft 4in (2.54 m) ahead of the wing and 5ft 2in (1.57 m) behind it. The wing span was increased by 5 ft (1.5 m), and the latest Mk. 512 version of the Spey was used. The new version sold reasonably well across the world, particularly to European charter airlines. In 1971 it received an incremental upgrade to reduce drag and reduce runway requirements. BEA/British Airways 500 series aircraft (denoted 1-11 510ED) varied significantly from other 1-11s, at BEA's request. The One-Eleven 510ED had a modified cockpit which incorporated instrumentation and avionics from or similar to that of the Hawker Siddeley HS.121 Trident, for better commonality with the type (which at the time was the BEA/BA shorthaul workhorse). Their additional equipment included a more sophisticated autoflight system, which allowed CAT II autolandings and included an autothrottle (autoland functionality was removed from most aircraft later in their careers). The modifications went as far as reversing the 'on' position of most switches to match that of the Trident; indeed, the 510ED was so different from other One-Elevens and 500 series aircraft that a different type rating was required to fly it, despite the fact that aside from the flight deck it was basically identical to all other 500 series aircraft. Having faced competition 'from above' with the aforementioned US aircraft by 1966, by 1970 the One-Eleven also faced competition 'from below.' The new competitor was the Fokker F28. Available as a four-member 'family,' it was lighter, less complex, and cheaper. The One-Eleven 475 of 1970 was launched to compete with the F.28. It combined the 400 fuselage with the higher power and larger wing of the 500 and was intended for hot and high operations. Only ten of the One-Eleven Mk 475 were sold. In 1977, the One-Eleven 670, a quiet and updated 475, was offered to the Japanese domestic market, failing to sell. Total deliveries for 1966 stood at 46 aircraft, and another 120 were delivered by 1971. At this point orders slowed to a trickle. British production continued until 1982. There were two reasons why the production line was kept open for just 35 aircraft delivered over 11 years: first, BAC hoped that Rolls-Royce would develop a quieter and more powerful version of the Spey engine, making possible further One-Eleven developments; second, throughout the early part of the period Romania was negotiating to buy the entire One-Eleven programme and transfer production of the type to Bucharest. By 1974, BAC invested significant effort into launching the One-Eleven 700. This had a longer body with a 134-seat interior and the projected Spey 67 engine producing greater power. It was approximately the same size as the latest DC-9s and 737s and would have been available in time to prevent large-scale defections by One-Eleven clients to McDonnell-Douglas and Boeing. Rolls-Royce was still recovering from bankruptcy, however, and the uprated Spey failed to materialise. An altogether less ambitious 700 made a reappearance in 1978 as a 500 with specially 'hush-kitted' Speys which would be replaced by the proposed RB432 in the mid-1980s. This was offered to British Airways in competition with Boeing 737-200s, but was rejected. In 1977, BAC merged with Hawker Siddeley to form British Aerospace (BAe) and the One-Eleven 800 was proposed with CFM-56 engines. It would have accommodated some 150 passengers in a mixed class layout. The One-Eleven 800's fate was involved with the development of a European competitor to ubiquitous U.S. short/medium range airliners and it did not progress to the design stage. In 1979, Romanian president Nicolae Ceauşescu signed the contract for One-Eleven licence production in Romania. This was to involve the delivery of three complete One-Elevens plus the construction of at least 22 in Bucharest, with reducing British content. It also involved Romanian production of Spey engines and certification of the aircraft to British and US standards. A market for up to 60 or even 80 cheap Romanian-built aircraft was mooted at the time, largely in China, the Third World and possibly Eastern Europe. The aircraft was redesignated ROMBAC 1-11. The first flight of a Rombac 1-11 was on 18 September 1982 and production continued until 1989 at a much slower pace than foreseen in the contract: nine aircraft were delivered. There were three reasons why the Rombac initiative failed: Romania's economy and international position deteriorated to the point where supplies for One-Eleven manufacture slowed to a trickle; the market foreseen by the Romanians failed to show an interest, though some Rombac machines were leased out to European operators; the One-Eleven's noise level and fuel economy had failed to keep pace with US and West European competition. With reference to the last reason, Rolls-Royce repeatedly refused to allow its Tay engine to be used on Romanian One-Elevens. This reluctance is assumed to reflect fears that the Fokker 100, the Tay's launch airframe, would suffer from Romanian competition. Total production of the One-Eleven in British and Romanian factories was 244, with two airframes left incomplete in Romania. A major initiative to re-engine corporate One-Elevens with Tay engines gathered pace in the USA in the late 1980s and early 1990s but came to nought after several successful test flights. Passive opposition from the engine maker among other factors is claimed to have sabotaged its chances of success. One-Elevens served widely in the USA until displaced by the indigenous Douglas DC-9 and Boeing 737 in the early 1970s. In Europe they were common, continuing in widespread use until the mid-1980s and into the 1990s. Many One-Elevens then moved to smaller airlines, notably in the Far East and Africa. The last major operations were in Nigeria, where they were grounded after a crash in 2002. Today only a handful are still operating, mainly in Africa, though corporate versions survive in the USA and Europe. A further nail in the coffin for the One-Eleven in Europe was the Stage III noise abatement regulations which took effect from March 2003. The costs of bringing the Rolls-Royce Spey engines into compliance with this, by developing a hush kit, proved an expensive prospect for the smaller operators still using this aircraft type. Therefore very few 1-11s were fitted with hush kits, and most European operators disposed of the type from their fleet. Several dozen One-Elevens are in storage and for sale around the world. Initial production version, widely sold; individual customer designations within this series. 56 built. Uprated engines, more fuel for longer range; individual customer designations within this series. 9 built. Series 300 with American instrumentation and equipment; the definitive short-body version; individual customer designations within this series. 69 built. Series 400 body with Series 500 wing and powerplant plus rough-airfield landing gear and body protection. 9 built, including 3 for Oman. Extended body version with up to 119 seats; new engines; individual customer designations within this series. 87 built. Variant of the 500 series built for BEA/British Airways. Size and engines same as other 500s, cockpit modified to provide more commonality with HS.121 Trident and required a different type rating from all other 500 series One-Elevens. The BAC One-Eleven was widely used by civil and military operators. As of August 2008 a total of 12 BAC One-Eleven aircraft (all variants) remain in airline service with International Trans Air Business (2), Libyan Arab Airlines (2), Aquiline (2), Indonesia Air Transport (2), Romavia (3) and TAROM (1). * On 6 August 1966, Braniff Airways Flight 250 disintegrated in mid-air after flying into a severe thunderstorm near Falls City, Nebraska. It was en route to Omaha, Nebraska, from Kansas City, Missouri. Thirty-eight passengers and four crew members were killed in the crash. The plane was a BAC One-Eleven-203AE, registration number N1553. * On 23 June 1967, Mohawk Airlines Flight 40 suffered a loss of pitch control following an on-board fire that caused heavy damage to the tail of the aircraft. Flight 40 was a regularly scheduled passenger flight between Elmira, New York and Washington, DC. It crashed outside of Blossburg, Pennsylvania with a loss of all 34 passengers and crew. The aircraft was a BAC One-Eleven-204AF, registration number N1116J. * On 6 September 1971, a Pan International BAC One-Eleven 515FB aircraft collided with a bridge during an emergency landing on the Autobahn A7 near Hasloh, Germany, shearing off both wings after a double engine failure during takeoff. The water-injection system to cool the engines was inadvertently filled with kerosene instead of water; 22 of the 121 people aboard died. * On 10 June 1990, British Airways Flight 5390's cockpit window blew out at altitude after the wrong bolts had been used to secure it. Captain Tim Lancaster was blown half out of the cockpit by the pressure differential; members of the cabin crew clung to his legs to keep him from being blown out of the aircraft. The plane made an emergency landing at Southampton Airport. The pilot survived, as did all the crew and passengers. * On 4 May 2002, an EAS Airlines Flight 4226 BAC 1-11-500 crashes in a suburb of Kano, Nigeria shortly after takeoff killing more than 148 people.